This article is about the generic Star Corps Trooper. For the Star Corps Trooper with a pauldron, see Commander Bly. A Star Corps Trooper is a minifigure from the Star Wars Episode III: Revenge of the Sith theme, depicting a Clone Trooper from the 327th Star Corps. The Star Corps Trooper has the standard white legs with a black joint and plain black head piece that most Clone Troopers not from The Clone Wars subtheme have. However, the torso piece has unique printing on the front and back to depict patterns commonly found on Star Corps armour. This includes a vertical yellow stripe going down the centre of the front of the torso and yellow printing on the belt. Also different from the standard Phase II Clone Trooper design is the grey strap printed on the front right-hand side of the torso, and black printing on the back of the torso piece at the top above the printed backplate. The helmet piece is of a standard Phase II Clone Trooper helmet mould, but has a yellow stripe going down the middle. The 327th Star Corps were elite Clone Troopers under the Command of Jedi General Aayla Secura and Clone Marshal Commander Bly. The Star Corps carried out several missions throughout the Clone Wars, and when Order 66 was issued, Commander Bly along with three other troops from the Star Corps were responsible for the death of General Secura. 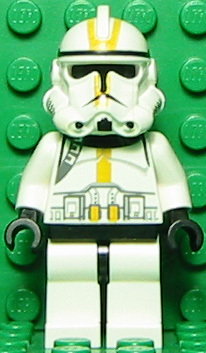 Although there is a Star Corps Trooper in the 2005 and 2006 releases of 7261 Clone Turbo Tank, this minifigure was identified solely as a Clone Trooper until the release of 7655 Clone Troopers Battle Pack in 2007. From then until 2014, that minifigure was referred to as a Star Corps Trooper. However, in 2014, a display at the 2014 Comic-Con International: San Diego confirmed that Star Corps Trooper to be Commander Bly. In LEGO Star Wars: The Video Game and LEGO Star Wars: The Complete Saga, Commander Cody appears as a Star Corps trooper with an orange pauldron, likely due to the fact that a more accurate minifigure of Cody had not yet been designed. The Star Corps Trooper Minifigure. Facts about "Star Corps Trooper"
This page was last edited on 26 September 2016, at 02:36.